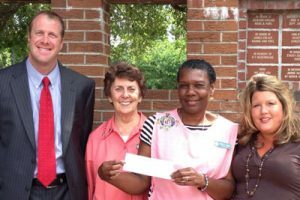 On Tuesday, May 28, Kerry Klein, founder of the Shamrock Run and the Town of Edgefield presented the Edgefield County Hospital Auxiliary a check in the amount of $4,567.00. The money was raised at the Shamrock Run in memory of Drs. Nicholson and Watson. The Edgefield County Hospital Auxiliary was most appreciative for the donation made to their organization and thanked Ms. Klein for all of her hard work to host the Shamrock Run each year.